Combining dance, martial arts and mindfulness, Nia tones your body while transforming your mind. More than just a workout, Nia is a holistic fitness practice addressing each aspect of your life - body, mind and soul. Every person can discover, explore, unleash and enhance their individual potential to live a healthy and meaningful life by engaging their senses and listening to their bodies. Nia is based on the intelligent design of the body. Each workout brings mindfulness to your dance movement experience, leaving you energized, mentally clear, and emotionally balanced. Nia cardio-dance workouts combine 52 simple moves with dance arts, martial arts, and healing arts to get you fit in 60 minutes - body, mind, emotion, and spirit. Nia is non-impact, practised barefoot, and adaptable to individual needs and abilities. Nia classes are taught by licensed Nia teachers. 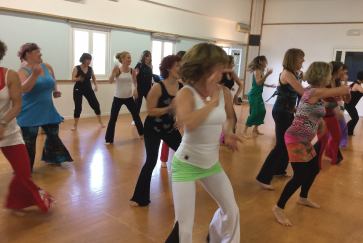 It is a movement practice that integrates the expressivity of the dance with the power and explosively of martial arts and the wisdom of healing arts. Created by Debbie and Carlos Rosas in 1983 in the States, Nia is now well known in Italy and across Europe. The guiding principle is the Joy of Movement, quite the opposite of some concepts of fitness based on “ No pain, no gain”. Nia trains the 5 body sensations that keep the body in balance and healthy: Flexibility, Agility, Mobility, Strenght and Stability. The movement is organic, based on the body design and functionality, adaptable to the different bodies needs and on the required level of conditioning.Music is one of the main ingredients of a class. Movement and music create the magic. Through the practice of Nia, habits can be transformed and a deeper connection to the beauty of our own body is the result, together with the invitation to self heal. Nia is effective and fun. It increases the pleasure of living in your own body. It creates weight loss and proper weight maintenance. It strengthen muscle, improves muscle tone, and increases muscle definition. It calms the mind and relives stress. It increases grace and flexibility. It balances the autonomic nervous system. It improves posture and can even increase height. It improves organ function- particularly that of heart and lungs. It builds reservoirs of chi. It alleviates emotional problems, including depression, anxiety, post traumatic stress disorders, obsessive-compulsive disorders, and anger-management problems. It improves circulation of blood and improves lymphatic drainage. It improves concentration and cognitive function. Nia is based on Joy of Movement and whoever wants to connect, reconnect or increase the pleasure of being in the body to this principle, will find it in Nia. Everybody can practise Nia, no matter the age or the level of fitness. Nia is adaptable and each individual can get the desired level of conditioning. Nia is danced barefoot to enhance body awareness.
" A dive in openwater at the rhythm of the music. It is playfulness between the waves of dance and focus. It is a smile and look to my deep inside, on a sewing body. It is an exploration of strength and freedom of movement, sometimes clear and soft, sometimes mixed with discoveries. " " Libertà e' un paio d'ali. Quando danzo sono libera di esprimere me stessa, la mia mente si rilassa, nessuno mi giudica. " " Nia keeps me fit in the most complete way. It allows me to move slow and fast, to dance, to meditate at the same time while having fun , all this accompanied by a beautiful music. Nia energizes me and makes me smile!! "